When it comes to Texas honky-tonk, nobody knows the music or the scene better than Johnny Bush. Author of Willie Nelson's classic concert anthem "Whiskey River," and singer of hits such as "You Gave Me a Mountain," "Undo the Right," "Jim, Jack and Rose," and "I'll Be There," Johnny Bush is a legend in country music, a singer-songwriter who has lived the cheatin', hurtin', hard-drinkin' life and recorded some of the most heart-wrenching songs about it. He has one of the purest honky-tonk voices ever to come out of Texas. And Bush's career has been just as dramatic as his songs�on the verge of achieving superstardom in the early 1970s, he was sidelined by a rare vocal disorder that he combated for thirty years. But, survivor that he is, Bush is once again filling dance halls across Texas and inspiring a new generation of musicians who crave the authenticity�the "pure D" country�that Johnny Bush has always had and that Nashville country music has lost. In Whiskey River (Take My Mind), Johnny Bush tells the twin stories of his life and of Texas honky-tonk music. He recalls growing up poor in Houston's Kashmere Gardens neighborhood and learning his chops in honky-tonks around Houston and San Antonio�places where chicken wire protected the bandstand and deadly fights broke out regularly. Bush vividly describes life on the road in the 1960s as a band member for Ray Price and Willie Nelson, including the booze, drugs, and one-night stands that fueled his songs but destroyed his first three marriages. He remembers the time in the early 1970s when he was hotter than Willie and on the fast track to superstardom�until spasmodic dysphonia forced his career into the slow lane. Bush describes his agonizing, but ultimately successful struggle to keep performing and rebuild his fan base, as well as the hard-won happiness he has found in his personal life. Woven throughout Bush's autobiography is the never-before-told story of Texas honky-tonk music, from Bob Wills and Floyd Tillman to Junior Brown and Pat Green. Johnny Bush has known almost all the great musicians, past and present, and he has wonderful stories to tell. Likewise, he offers shrewd observations on how the music business has changed since he started performing in the 1950s�and pulls no punches in saying how Nashville music has lost its country soul. For everyone who loves genuine country music, Johnny Bush, Willie Nelson, and stories of triumph against all odds, Whiskey River (Take My Mind) is a must-read. 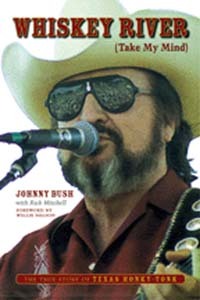 Johnny Bush was inducted into the Texas Country Music Hall of Fame in 2003. His recent albums include Texas State of Mind, Talk To My Heart, Lost Highway Saloon, Green Snakes, and Honky Tonic. He lives in San Antonio. Rick Mitchell was the country music critic at the Houston Chronicle for ten years. He is the author of Garth Brooks: One of a Kind, Workin' On a Full House and has written about all kinds of music for the past thirty years. He lives in Houston.